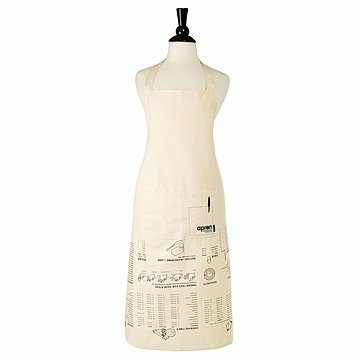 Keep all the useful kitchen information you need right in your lap with this cooking guidelines apron. It's happened to all of us: You're firing up a brand new dish, when all of a sudden you blank on how many ounces are in a cup. But bringing your phone, tablet, or computer into an active kitchen comes with the big risks: pots bubbling over, flour-coated hands, out-of-control oil spatters, and other cooking calamities. Leave your electronics out of harm's way and keep all the information you need right in your lap with this cooking guidelines apron. In addition to common kitchen conversions, this apron also features cooking times for vegetables and poultry, freezing and defrosting instructions, and even a spaghetti serving size guide. Printed upside-down for expedient reading, this apron allows you to convert with ease while you keep your saucy hands where they belong! Also, this apron has a built-in, large, front pocket for all your necessary gadgets. 100% unbleached cotton. Made in China. I love how this apron has some guidelines upside down. It's perfect when your a cooking and need to look at the instructions, you then lift the skirt part. I was so excited about this. My mom used to talk about these instructions and they are always buried somewhere. Now she has them when she is cooking! Great product fit as advertised on durable material that feels like an historic flour sack. This git was exactly as advertised. My wife is an avid baker and loves her aprons. This apron seems to be of great quality. And the cooking instruction graphics make it fun. Its cool to have all the measurements right there for you. All I can say is: why didn't I think of this idea? The greatest ideas stem from fixing simple life problems. It doesn't get more practical and useful than having all the measurements "on you" while cooking. My friend loves to bake and cook. This was a birthday gift for her and she loves it. She said it's roomy, good quality, and unique. I'm happy she's happy! Thank you, UG. It is difficult to find an Apron that is unisex but this is not only functional it is extremely useful to include all the cooking guidelines. My husband enjoys to cook and I can't wait to give it to him. Too large. The coverage would be better over the chest if the strap that goes around the neck were a tie instead of a fixed length. It's also warm since it wraps all the way around the body. I like this apron with all of the information it offers BUT it is way too large for me and I am an average sized woman (5'6" 130 lbs). Even though it is very large & can wrap around me twice I still like it.